Since the beginning of the modern era of computer science, tech innovators have been trying to come up with a computer that can think like a human. Networks and algorithms are now in place which tries to make decision making and human thought a mechanical process. This is what is known as Artificial Intelligence or AI. Today, AI is a very usable and real tool. Even as we speak, innumerable startups are springing up all over trying to harness the power of AI in order to commercialize the same. Some of the biggest tech companies in the world are also joining the race. Although AI technology is growing at a phenomenal pace, it has its own challenges and is often misunderstood in terms of its applications and limitations. Below, we discuss some of the attributes of AI not readily known to everybody. Artificial intelligence is basically a set of technologies, methods, and algorithms that make a software behave in human fashion in the eyes of an outside observer. In other words, technologies such as machine learning, robotics, natural language processing and computer vision are essentially all part of AI. Siri, Cortana, and Google Now are all examples of artificial intelligence that we use every day in our lives. 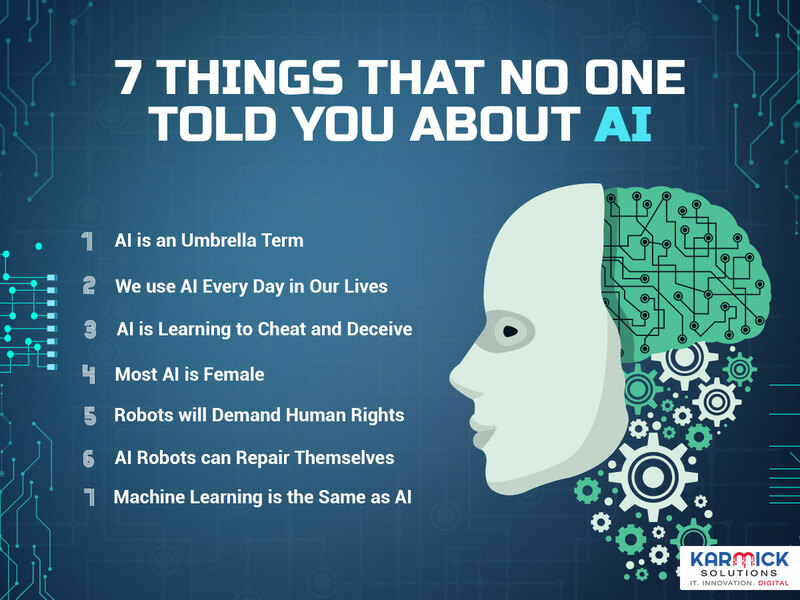 Besides this, AI can also be found in International Financial Markets, vacuum cleaners, medical research, cars, e-commerce software, lawnmowers, Hollywood Special Effects, Video Games etc. In 1956, John McCarthy famously termed the phrase artificial intelligence for the first time. He once remarked that as soon as something starts working, it is no longer called AI anymore. Lying is a behaviour that is found in a lot of animals. We humans resort to it all the time and it is also found in some species of other mammals and birds when it’s a question of survival. However, these days, technological advances are teaching AI to learn how to cheat and deceive as well. It is expected that once this technology is perfected, it can be used by the military in warfare and on the battlefield. AI robots who know how to cheat and deceive can trick the enemies in various ways in order to beat them. For example, they can be used as guards protecting ammunition and supplies. In the event of an attack, they can manipulate the enemy and keep them at bay till reinforcements arrive at their rescue. Having said that, arming AI technology with the knowledge to deceive and cheat has significant ethical repercussions. Researchers at the helm of this field admit that should this technology fall into the wrong hands, the consequences of the same could be dire. As many of us have noticed when interacting with AI such as Google Now, Cortana and Siri, the default voices tend to be female. There are a few factors that determine this. First and foremost, research suggests that both male and females prefer to interact with a female voice. Also, as per Karl Fredric MacDorman, an expert in human-computer interaction and a computer scientist, since most of the technologists working on AI today are men, they prefer female voices. Social anthropologist Kathleen Richardson is of the opinion that female AI comes across as less threatening than a male AI. With the rate at which AI technology is improving, it is only a matter of time before robots reach a state of self-realization. At that stage, they will in probability demand rights of their own. This will include health care and housing benefits, citizenship, to be able to serve in the military and the right to vote. In return, the government will levy taxes upon them. The aforementioned observations were made through a joint study conducted by the Innovation’s Horizon Scanning Centre and the UK office of Science. The BBC reported this research in 2006 when advancements in AI technology were at a rudimentary stage. This report was published to speculate the future of AI in about 50 years’ time. It is a little-known fact about AI technology that AI robots have the means of repairing themselves in the event of a malfunction or fault. In the event of some form of system failure, an AI robot is able to rebuild itself fairly quickly and easily. When an AI robot malfunctions in some form, it is not able to compute what is wrong with it. Instead, it detects that there is something wrong with its performance. Then, through the application of complex algorithms and trial and error, they are able to pinpoint the root cause of their ailment and remedy the same. Although there may remain subtle differences, for the most part, machine learning and AI are more or less one and the same thing. In fact, according to professor Thomas Dietterich of Oregon State University, the difference between the two terms may be traced back to their regional inception. Machine learning is a term that is more popular in Europe whereas AI is much more popular in the US. For example, in Canada, the same terms are often referred to as computational intelligence.